What did Jesus mean when He said if you have faith as a mustard seed? Does this mean that we only need a small amount of faith? Can tiny amounts of faith really move mountains? What is the meaning of this saying of Jesus and the applications for our life? Mustard trees have been found in various locations throughout the world. Even though it’s one of the smallest seeds, the trees can grow up to 20 feet tall and 20 feet wide. The tree can grow in arid, dry climates and thrive even in clay or sandy soil. It can grow in hot, dry weather or cool, wet climates. I see the mustard seed as being symbolic of faith in that our faith can be tested in the “dry times”, the most difficult of circumstances (drought, poor soil, and in clay or sandy ground). Also, even if the tree is cut down to the trunk, it can grow back again, so the analogy is that even during times of pruning, the believer can overcome and come back stronger than ever, just like the mustard tree that’s been severely pruned and even if only a tiny bit of faith remains. The mustard tree is drought tolerant and if we have faith even the size of a tiny mustard seed, we too can tolerate the dry times in our lives, the difficult growing seasons of a Christian, and even when we are “planted” in poor soil we can still grow, even if we only have a small amount of faith. Incidentally, the mustard tree has many uses. The leaves can be made into, you guessed it, mustard. The tree can produce edible salts, some have used the small branches as toothbrushes, the leaves have been shown to prevent tooth decay and alleviate tooth aches. The implications of this tree are not lost in a dead and decaying world. A mustard seed is only 1 to 2 millimeters which is about 1/64th of an inch! Many non-believers have criticized Jesus by saying that the mustard seed is not the smallest of seeds, but the fact is Jesus never said the mustard seed was the smallest, but was one of the smallest. The fact is that it is almost the smallest seed there is for a tree and it is so amazing that the tiny mustard seed produces a tree, not a tiny plant like many believe. 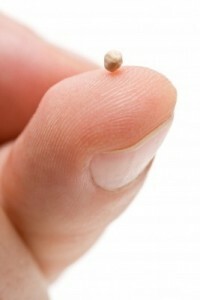 A mustard seed is only 1 to 2 millimeters which is about 1/64th of an inch! I believe that Jesus’ point is that it only takes a tiny amount of faith to “move mountains” because Jesus said, “According to your faith let it be done to you” (Matthew 9:29). Jesus compared the mustard seed to the Kingdom, saying “The kingdom of heaven is like a mustard seed, which a man took and planted in his field” (Matthew 13:31) and “If you have faith as small as a mustard seed, you can say to this mulberry tree, ‘Be uprooted and planted in the sea,’ and it will obey you” (Luke 17:6). Jesus seems to be saying that the Kingdom of God, at the time of Jesus‘ earthly ministry, was small in the beginning and from this tiny seed, it would grow and grow. Would this growth ever stop? No, as Isaiah wrote, “Of the greatness of his government and peace there will be no end. He will reign on David’s throne and over his kingdom, establishing and upholding it with justice and righteousness from that time on and forever. The zeal of the LORD Almighty will accomplish this” (Isaiah 9:7). This tiny “seed” would never stop growing and when the King of this Kingdom comes to rule in power on earth, it will apparently continue to grow for ever and ever. It appears that this Kingdom will expand for all eternity and perhaps into the entire universe…all from one of the tiniest (most humble) of beginnings. “You of little faith, why are you so afraid” (Matt 8:26)? “If that is how God clothes the grass of the field, which is here today and tomorrow is thrown into the fire, will he not much more clothe you–you of little faith” (Matthew 6:30)? “Immediately Jesus reached out his hand and caught him. “You of little faith,” he said, “why did you doubt” (Matthew 14:31)? “Aware of their discussion, Jesus asked, “You of little faith, why are you talking among yourselves about having no bread” (Matthew 16:8)? Jesus rebuked the disciples so often about their having “little faith” because they doubted His divinity. I too have been guilty of having little faith and I am not proud to admit that. Is He not God and being God, is He not all powerful? Yes, but my humanity is too often pushing this knowledge out because I tend to only believe what I see. I must believe with the eyes of faith. My eyes that may not see Him must succumb to my head knowledge and heart knowledge that He is there nonetheless. In fact, when I show a lack of faith I miss out on a blessing. Even though I have never seen Jesus, I know that He exists and He is there for us. We will see Him someday. That’s why only a tiny bit of faith can go a long, long way. Even if it’s 1/64th of an inch. I love this article. The analogy you presented between the mustard said and our faith (grows in drought, in wet…etc.) was great. It made be think that it’s not how much faith we have, but in Whom our faith is placed, that makes the difference. Powerful article brother. Thank you so much Robert. As I told Josh, all glory to God in Jesus Christ for the power is in His word and not mine. I appreciate your encouragment nonetheless my good friend. Very helpful article. Thank you….. Thank you Mr. Hopkins for your kind words sir…you are an encouragement to me. Like Robert wrote above, I too appreciated the analogy between the mustard see and our faith. Thanks sooo much for another enlightening article with Scriptures, Pastor Jack! Thank you Patty. You are ever the encourager my good friend. I can only reflect any worth of this to the Lord and God to Whom I serve and to Him be all the glory. I really got a lot from your writing this article. I loved the information you provided on the Mustard seed as it helped so much to understand better what Jesus said. Thank you Josh. I can only boast on God and His glory, may He alone be glorified but I do appreciate your kind words my friend. Brother…. I praise the Lord. Now at the age of 61 + years, I could know the meaning of the “Mustard seed” example. God enabled me to understand from your simple elaboration. May God bless you more & more to make people understand His words in simple way. To God be the glory & thanks to you. An article like this is a great display of Spiritual discernment of the Word on your part Jack. Something everyone who is a believer should ask God for (myself included). Like Ranjan i have finally really really understood the meaning of this parable, thanks to your simple yet deep analysis of this great parable. As i read this article i thought i need to just get a reminder of what Faith is and wow right there towards the end Hebrews 11: Bible Study on Faith!!!! Hi Jack. The Lord bless you. It is exiting to note how symbolic the mustard is. It is enlighenning and informative to realize what ones faith in Christ can achieve if well nourished and nurtured. God bless. Thank you Rajulas. You are such an encourager my friend. May God richly bless you for your words of edification. Wow! I never looked at it that way before. Thanks, my brother & friend, for further restoring my hope. Joe, you are more kind to me than I deserve. Thanks brother. O what a Mighty God. The God who is present everywhere absent nowhere. Man of God,since i got yr site i am so blessed bcos every day i grow spiritually. The mustard seed, i never knew the meaning now my ears are opened spiritually & physically let the good God shower u with more days to win more souls like mine in Jesus name. Thank you so much Rebecca. You are more than too kind. What can I boast about? Nothing, for what do I have that I did not receive (1 Cor 4) and to truly, all glory goes to God our Lord. To Him be praise…Jesus Christ, King of kings and Lord of lords. Pretty amazing Megan. God’s ways are past finding out and the way that He uses other people to help us is just one of those amazing ways. Thank you for your comment. Thank you so much my friend. Greetings to you there in Uganda from America. I am so glad you liked this but all glory is to Christ and to Him alone. Many people believe Jesus was talking about Small Faith. But this is about unwavering faith. A muster seed, even with today’s science CAN NOT be changed by another seed like other seeds can. For example: take Hot pepper and grow it with parsley you will get a spicy parsley. or a pepper with tomato hot tomato or a soft juicy pepper but mustard grow with anything WILL NOT CHANGE. That is what Jesus is referring to and the people then knew that. No changing or wavering in your faith like a mustard seed never changes or weavers it will always be a mustard seed that grows into a mustard tree. Can I use your article for my Life Ministry Coaching? I will use this in my small group life coaching and mentoring. God indeed bless your ministry more and more. Thank you Rey for your encouragement. You can certainly print it out and make copies if you wish. We too have a mentoring program sort of like a discipling of others so may God richly bless you in this growing in His grace and in His knowledge for His glory. Let me add a revelation to this comparison that Holy Spirit gave me recently. It is not so much about your mustard-seed-faith as it is about knowing and trusting the power, the DUNAMIS, that operates through you, i.e. Holy Spirit that through you moves the mountain, NOT the amount of faith you have (in yourself to do it), therefore the amount of faith is irrelevant and your abilities are irrelevant, that’s why the Lord says you only need the tiniest bit of faith, you just need enough faith to believe that God can do it, therefore faith is not the determining factor to move the mountain. What is, is to know the dunamis Power in which you operate, and your authority in Christ, that is what will move the mountain. You don’t need faith in yourself, you need faith in God’s power and you are the available person that partners with God to bring it to pass. Now, I can preach well about faith like mustard seed. Thank Brother. Thank you brother… i will be preaching this Sunday about faith.. great insights… truly wisdom from God. Thank you kindly sir. May God richly bless your message. Pastor Jack, this message has changed my life for the better, especially as we begin the new year. I thank God for directing me to this message. I have read each word and paragraph prayerfully. I need more of your spirit-led articles. Praise the Lord for your faith. It is all because of Him. I am only an unworthy servant doing his duty so all glory to God (Psalm 115:1) but thank you for the encouragement my friend. Hi Jack, the article is powerful 5 year later and counting! The mustard seed is faith, the Kingdom. Small yet resilient, powerful, strong. I need, in my life faith as a mustard seed. Please do pray for me. I need it. Praying right now for you Dawud. Wonderful article on the mustard seed. I had never studied the mustard seed before. Request permission to use the mustard seed information on our Bible study website. I might shorten it retaining its content. We will cite your work. Our Bible study website; CleanBible.com is up but still under construction. You are welcome to use an shortened version and give the author credit. PS…your website looks terrific. Nicely done.